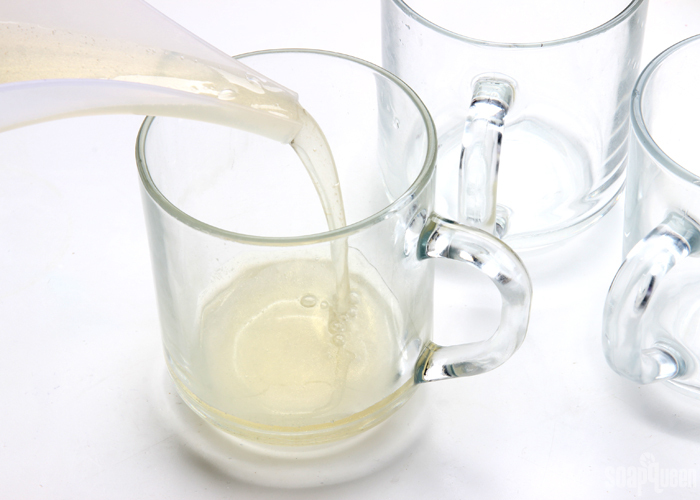 ONE: Chop and melt 10 ounces of Clear Melt and Pour Soap base in the microwave using 15-20 second bursts. 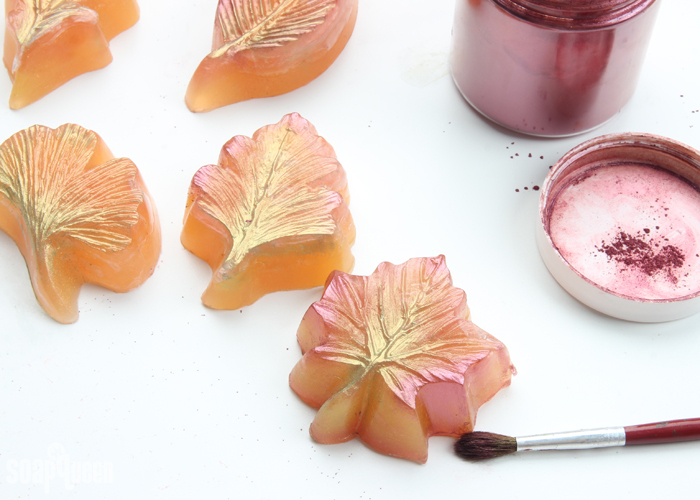 Once completely melted, add shavings of the Shimmer Sparkle Gold Color Block. This gives the soap just a bit of extra shimmer. 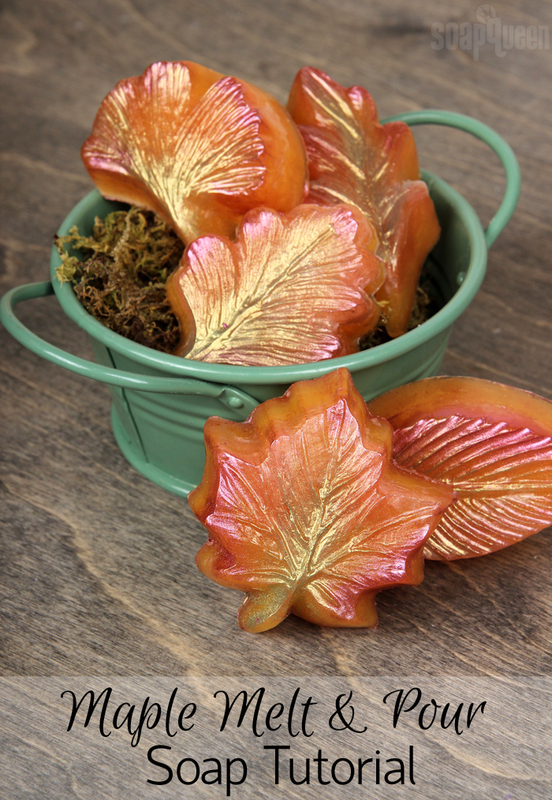 Mix in the Vermont Maple Fragrance Oil and Vanilla Color Stabilizer. TWO: Split the soap evenly between three small containers. FOUR: Pour a small amount of the red soap into each cavity, and move the mold around to disperse the red soap in the corners and side of the mold. 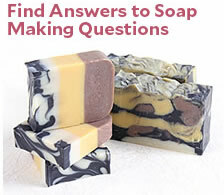 Continue moving the mold and soap until it cools and hardens. Then, pour a little more red soap into each cavity, concentrating the color on the outside edges. 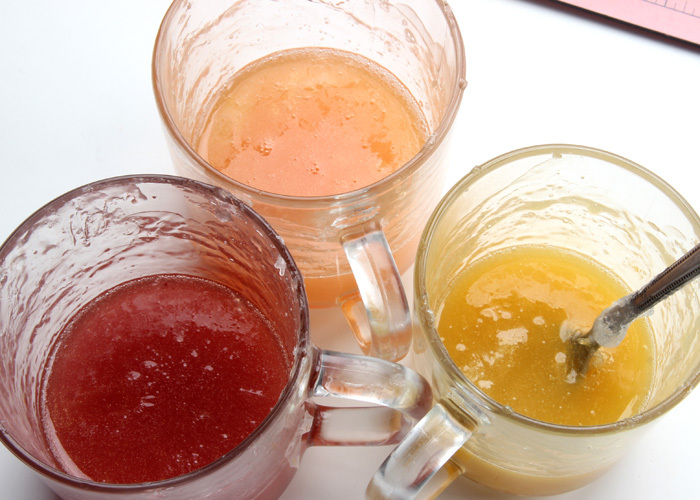 Spritz with alcohol to disperse any bubbles, and allow to cool and harden. 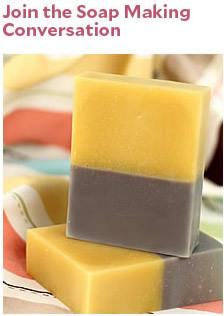 FIVE: Reheat the yellow and orange soap if necessary using 3-5 second bursts. Because you’re heating such a small amount of soap it’s easy to burn, so short bursts are key. 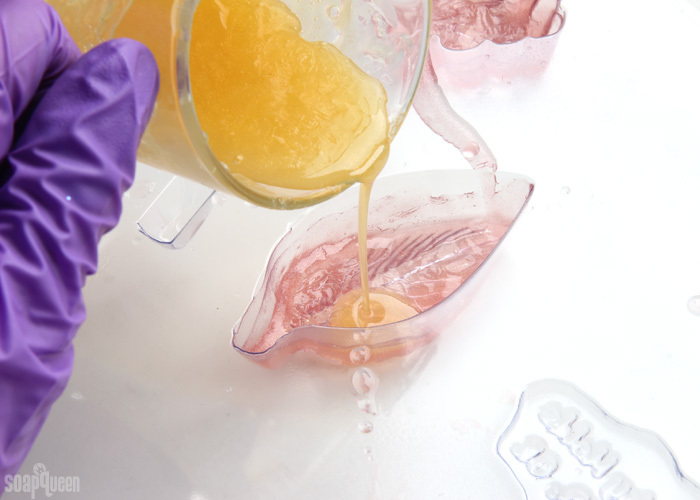 Wait until the soap has reached 125-130 ° F. Then, spritz with 99% isopropyl alcohol to help the layers adhere and begin pouring the yellow and orange soap into the molds, layering and swirling the colors. 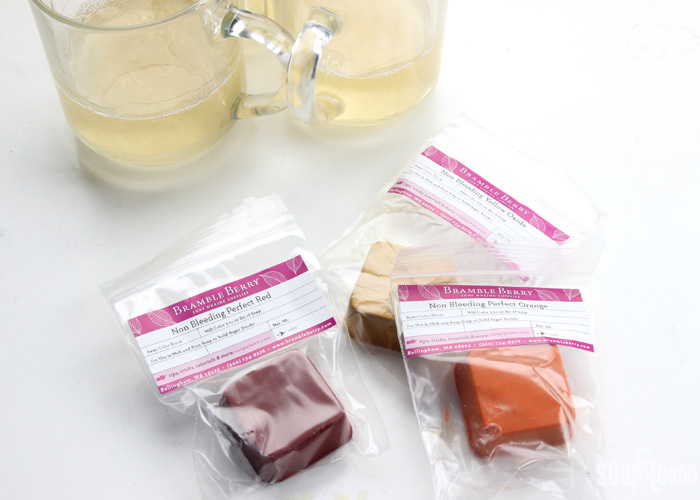 Spritz with alcohol to get rid of bubbles, and allow the soap to fully cool and harden. 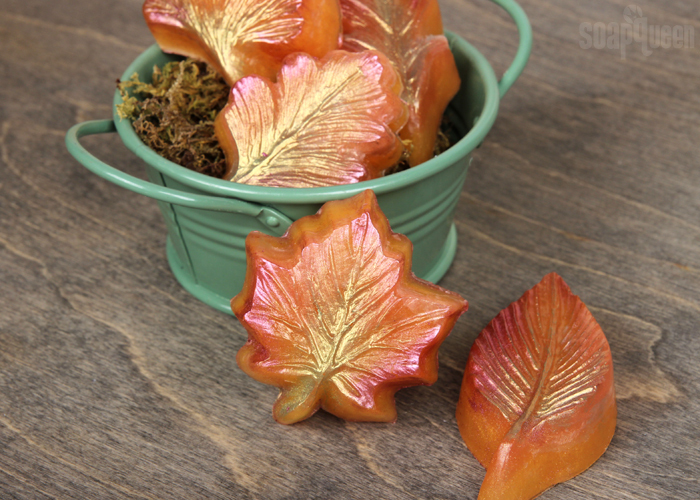 If you have some soap leftover, reheat and pour into an extra mold. 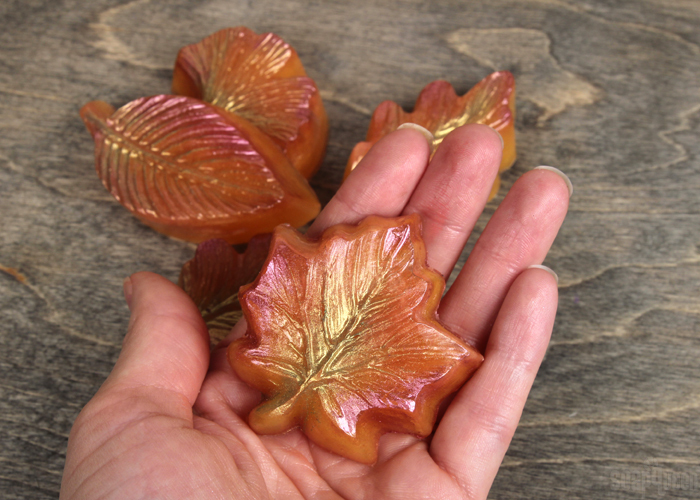 SIX: Remove from the molds by pressing the back of the soap firmly with your palm. 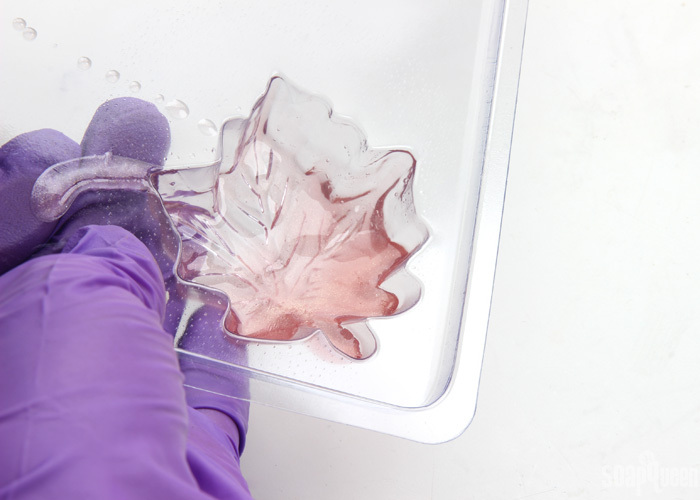 If it’s having trouble releasing, place the mold in the freezer for about 5-10 minutes and try again. Don’t leave the soap in the freezer too long, or it can cause glycerin dew. 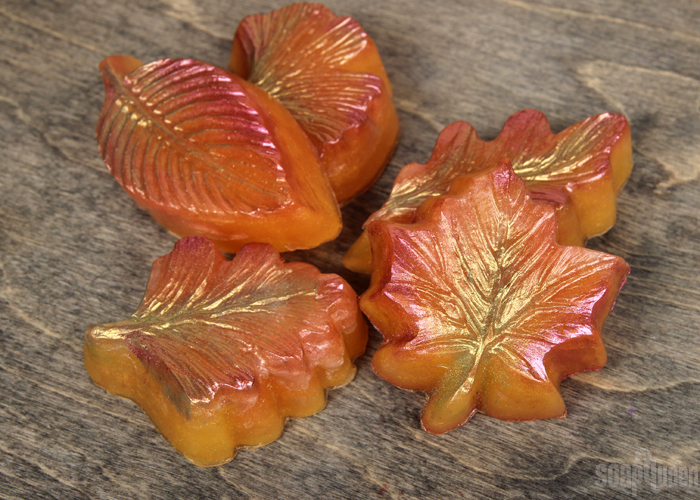 Once removed, dust the soap with Evergreen Mica and Merlot Sparkle Mica to give the soaps extra dimension and sparkle. This step is optional, but it really makes the bars pop! The sparkle will wash off after one use.